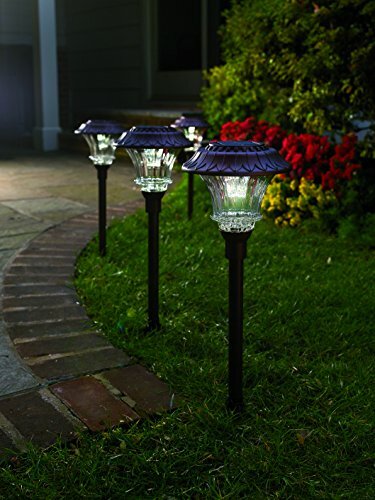 These super-bright Solar LED Path Lights from Plow & Hearth shine brighter, longer and stronger. One of the brightest on the market, each path light has 6 super-bright LEDs with a powerful 50-lumens output. Other solar lights average only 3-5 lumens, making ours 10X as bright and an excellent value. Plus, our Solar LED Path Lights are attractive and well-made, so they make an elegant addition to your home with their curb appeal. Built to last, our solar lights feature heavy-duty powder-coated aluminum and stainless steel construction with glass lamps that reflect even more light. The extra-large, built-in solar panel allows for up to 8 hours of light when fully charged. Quick and easy to assemble and install; no wires or electricity needed. Lights turn on automatically at dusk and have an optional on/off switch. Each light comes with (and eventually requires replacement of) one LIFEPO4 size 14430 rechargeable solar battery 3.2V 400MAH. Size: each measures 6" dia. x 23"H.